Versatile knotless nylon netting has thousands of uses, and Mid-Lakes customers know they can count on us for prompt delivery and the best quality available. Our tough netting can be dyed and treated to your specifications. We can supply it in bulk, or, in many cases, we can cut and sew it for you. Manufacturers: Let us be your netting source! We are a prime manufacturer of knotless nylon netting. This means you'll deal directly with the factory to get the best price and service available. 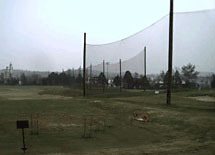 Our barrier netting can be found on driving ranges all over the world. Our barrier and divider nets are used in giant warehouses as a visual separation barrier between areas and to separate products. Freight companies use our cargo nets to cover and separate loaded skids. Knotless netting is perfect temporary fencing for events or construction sites. A large office supply company uses our netting for under-ladder storage and to catch discarded packaging. Our netting is used by factories and businesses to catch items that might fall from conveyor belts, ladders or racks. Our tie-down nets provide a lightweight, yet strong covering for trucks or trailers. Our mesh laundry bags are used extensively by hotels, laundry services, hospitals, factories, prisons and schools and can be custom sewn in the sizes you need. 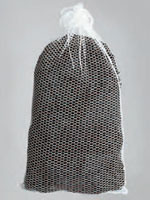 Our bulk tube netting comes in many colors and can be fabricated into hundreds of products. Our knotless nylon netting silt and filter bags are used for erosion control and irrigation system drains in golf courses, and in residential and commercial areas. Our oil-absorbing bags and tubes are used by environmental cleanup companies for oil spill containment and cleanup, and have many other industrial uses. Mid-Lakes net are used for storage pockets in boats, trucks and automobiles. Our beautiful Titan netting is used for net storage pockets in ski boats, fishing boats, yachts and houseboats and in automobiles, customized vans, motor coaches and tractor trailer sleepers.